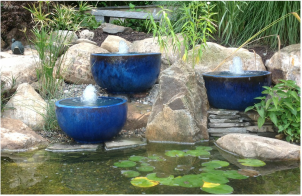 Landscape Garden Fountains, Fountainscapes or Backyard Fountains are small decorative water features such as tabletop fountains, container water gardens, stand-alone fountains, bubbling urns, spitters, and fountains that incorporate an in-ground reservoir. Landscape Garden Fountains are gaining popularity due to their ease of set-up and maintenance. Found at garden centers and home improvement stores across America, a wide range of styles and finishes are available to fit everyone’s taste and budget. ​From impressive brass to simple resin fountains, these features are made to “stand alone,” meaning they don’t need any counterparts to make them function. Much like a tabletop fountain, all you need to do is add water, plug it in, and enjoy. Some larger units may require a bit of simple assembly. ​Once you find a landscape garden fountain that fits your style and budget, all you need to do is find the perfect location for it. You can place it in the foyer of your home to greet guests, or set it outside on the back deck to enjoy during a cool summer evening. Tuck one near a garden path or by the front entrance of your home. You’ll soon find you want more than just one fountain to grace your landscape. The sound of water draws visitors into your garden and provides a place for the eyes to rest while enjoying the outdoor spaces. These larger landscape garden fountains are typically set atop an underground reservoir that keeps re-circulating the water. Once the urn fills with water, the water spills out and over into the underground basin, which pumps the water back up through the urn. If a spitter or decorative fountain is more to your liking, you can still set it on the reservoir and a pipe will transfer the water from the basin up through the center of the spitter or fountain. A Frog’s Dream Aquatic Services provides an extra large reservoir called the AquaBasin™. The AquaBasin supports up to 2,000 pounds and holds 75 gallons of water. Large basalt columns can be set atop the basin for a truly impressive decorative water feature in the landscape. For a more formal look, try an impressive brass sculpture. FountainScapes and Backyard fountains are limited only by your imagination. If water can be pumped through it, over it, or under it a truly unique one of a kind fountainscape can be created. Extravagant multi-faceted bubbling urns, boulders, and waterfalls can be incorporated to create a jaw dropping creation. As you can imagine, though, these creations can be simple, subtle, and produce a high impact peaceful area for relaxation. Custom fountainscapes are not limited to stand-alone fountains. A Frog's Dream has been incorporating these beautiful features into the construction of waterfalls and ponds adding a unique accent and focal point. A Frog's Dream Aquatic Services is a Morris County, New Jersey area based full service Pond contractor & Pond Maintenance landscape company specializing in naturalistic water features, and unique outdoor spaces, including Ponds, Water Gardens and Stream Design, Construction, Repair, Renovation &Maintenance Serving Morris County, Hunterdon County, and Somerset County in New Jersey. A Frog's Dream was founded to fill a need for a full service water feature company that truly cares about the details of every project and service.